Graphene Industries -> What is graphene? The surface of a graphite crystal. Graphite is a layered material, and can be separated into sheets, forming structures like folds and pleats. Graphene is a member of the class of 2-dimensional materials discovered by Professor Andre Geim's research group at the University of Manchester (Please note that although Graphene Industries is run by a team that has worked closely with Professor Geim, he is not personally involved. As such, please do not contact Professor Geim in relation to this site or its products). It consists of a hexagonal array of sp2-bonded carbon atoms, just like those found in bulk graphite. 2D materials display very interesting properties, and are fundamentally different from the 3D materials we encounter everyday. The discovery of 2D materials means that scientists now have access to materials of all dimensionalities, including 0D (quantum dots, atoms) and 1D (nanowires, carbon nanotubes). Why haven't we discovered these materials until now? Largely because we haven't looked. There are theories (please see our about us page for relevant publications) which show that graphene should not be able to exist without being destroyed by thermal fluctuations. These fluctuations should cause the crystal to melt. Workers who tried to create atomically thin films of other materials in the past found that the films were unstable and tended to separate and 'clump up' rather than form perfect layers. In fact, anyone who has ever written with a pencil has probably created graphene flakes. The graphite in a pencil lead separates into sheets when rubbed across paper, and the chances are that one of these sheets was only a single layer thick. What kind of uses does graphene have? A graphene-based Hall bar device with gold contacts lying on an Si/SiO2 substrate. The conducting state of the device can be affected by applying an electric field to the Si. Graphene can be used to make excellent transistors. It is so thin we can easily control whether or not it conducts by applying an electric field. We would like to be able to do this with metals, but we cannot make metal films thin enough to affect their conducting state in this way. Electrons in graphene also travel ballistically over sub-micron distances. As a result, graphene-based transistors can run at higher frequencies and more efficiently that the silicon transistors we use now. At the present moment we have no way to produce entire integrated circuits from these transistors since we are limited by the size of graphenes we can produce. Gas molecules that land on graphene affect its electronic properties in a measurable way - in fact, we have measured the effect of a single molecule associating with a graphene. This means that we can create gas sensors which are sensitive to a single atom or molecule! 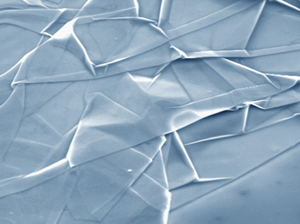 Graphene is effectively the thinnest material that we can make out of atoms. Suprisingly it is also very strong, thanks to a lack of crystal boundaries to break along and very strong bonds between carbon atoms (Carbon nanotubes are made from rolled up graphene, and it has been suggested that cabling made from nanotubes would be strong enough to create an elevator into space!). As a result we can use it to hold micro- and nanoscopic objects we wish to look at in an electron microscope (e.g. DNA, nanoparticles) in a similar way we use glass slides in an optical microscope. Graphene is the perfect material for this job as it is made only of carbon, it is very thin so will not interfere with the pictures taken as much as other materials, and has a very simple crystal structure so can easily be eliminated from diffraction patterns. Graphene is resistant to attack by many powerful acids and alkalis such as hydrofluoric acid and ammonia, so one day could be used to give objects an atomically thin protective coating which would provide protection against these agents. Although it will likely be many years before we see any of these applications fully realised, the discovery of graphene has provided an unparalleled opportunity for scientists to investigate these possibilities.